Sadly, there are some people who are afraid that they have committed the unpardonable sin and are beyond redemption for eternity. While it is good to be concerned, the unpardonable sin is not something that can be committed casually. Think about it. God is not capricious and willing to condemn someone for such a serious sin committed in ignorance or by something said in haste. There are several views on this sin. One is that it cannot be committed today, it was a "game over" for the Pharisees who had been condemning him and had finally crossed the line because of the constant hardening of their hearts. Another view is that this sin is the rejection of salvation, where someone dies without Christ. (In the latter case, the end result is the same.) Even some Christians are afraid that they fouled up somehow, and take the unbiblical view of losing their salvation because of it. 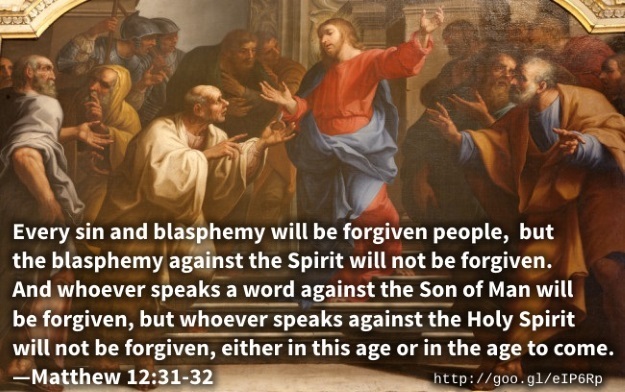 Indeed, one view is that blasphemy against the Holy Spirit is resisting his promptings to repent of specific sins, and it implies that a Christian can lose his salvation, which is false. But if someone is worried that they have committed this unpardonable sin, that itself is a sign that you are not beyond hope, and the situation can be resolved. A tragic imagining: Someone has died and stands before God. He asks why that person rejected salvation through faith in Jesus Christ. The offender replies, "I figured I committed the unforgivable sin, so I went on with my business". Here are some articles, and a link to three sermons by Phil Johnson on the subject. Although I found the second sermon to be the most interesting, the first one is very helpful in setting it up. The third sermon is interesting as well. To hear those, click on "The Unpardonable Sin". What is the unpardonable sin? What is the sin that will never be forgiven? What is the unpardonable sin / unforgivable sin? While a truly born again believer in Jesus cannot commit this sin, there is no excuse to "live like the devil". Someone who claims to be a Christian and does not "bear fruit in keeping with repentance" is probably unsaved. In fact, a sign of true repentance is wanting to live to please God. I recommend hearing "Hell's Best Kept Secret" as well as "True and False Conversion", available at this link. The above resources should help settle anxieties and disquieting doubts about going to Hell because of a mistake.